This new edition brings Siddiqa’s account fully up to date with a new preface and conclusion that emphasize military’s control of the media. The book adds to the existing literature on civil-military relations beyond Pakistan by arguing how modern day professional militaries do not necessarily need to do a coup d’état but can displace a civilian government conceptually and make it ineffective by taking control over governance and interfering with day to day running of the state. Thus, returning to the barracks or staying outside turns into a broader metaphor according to which unless there is de jure control of the military by a civilian government we cannot imagine the military to not be in power. The military like Pakistan’s, which has altered rules of the game of power, will also use media as a technology to build its reputation and morph the national narrative in a manner that would support the defense establishment’s control of governance and the state. Pakistan occupies a paradoxical, even contradictory place in American foreign policy. Nominally a strategic ally in the war on terror, it is the third-largest recipient of US aid in the world. At the same time, it is run by its military and intelligence service—whose goals certainly do not always overlap with US priorities. This book offers a close look at what the rise of the military has meant for Pakistani society. 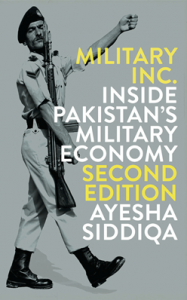 Ayesha Siddiqa shows how entrenched the military has become, not just in day-to-day governance, but in the Pakistani corporate sector as well. What are the consequences of this unprecedented merging of the military and corporate sectors? What does it mean for Pakistan’s economic development—let alone for hopes of an eventual return to democracy and de-militarization? But this is not simply a book about Pakistan. The background for the book is the theory, originating among US academics, that the military is the most modern institution in developing societies, and that a politically strong military will therefore develop a country. This view is associated with Morris Janowitz and Samuel Huntington. Being Pakistani, Ayesha Siddiqa has noticed that their theory has not worked. She explains why in this book. The book covers: the theoretical concept of Milbus, which she introduces; the Pakistani military; the political history of Pakistani; the four foundations that run the major investments of the Pakistani military; diversion of state land to private purposes in the interest of senior military officers; the cost of Milbus; and some speculations about its likely impact on the future of Pakistan. These appear sound to a non-expert on the Pakistan army. While talking about military business as a separate genre of military capital, the book explains how in developing societies military’s economic power mixed with its political clout will metaphorically become a Marxist vanguard party. This is most likely to happen in political systems where civil-military relations are not developed. There are negative impacts of this economy even in developed states but in developing states the extent of damage is much higher. A military in a developing state environment has some advantages in performing role of a Marxist vanguard partyy, notably including greater administrative competence than a Marxist vanguard party usually has. But it lacks a concept of the revolutionary transformation of society, and it has a entirely different mission from social development, which is national defense. It is subject to the same tendency to corruption as a Marxist vanguard party. So the military can develop society to a certain extent, but does so in the interest of military officers, who become a class in the Marxist sense themselves. Corruption, diversion of public resources to private purposes, etc, which are a big issue with Marxist vanguard parties in power, are also serious problems with military led development. 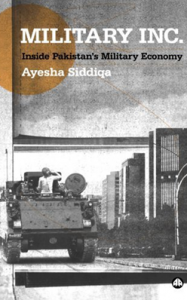 The book makes a case based on the example of Pakistan about how the economic interests of the military both increase its political power, and give it an incentive to expand its political power rather than “returning to barracks”. The strategic imperative is held as the primary explanation for Pakistan’s military buildup. This book presents a fundamental departure in presenting an analysis of the internal dynamics of defense management and decision-making in Pakistan – a new nuclear weapon state. 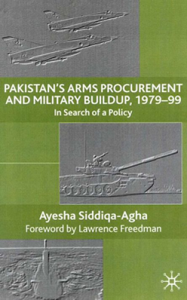 This is an in- depth study of Pakistan’s security link with its arms suppliers and defense industrial capacity, and the influence of Pakistan’s Army on conventional and non-conventional defense decisions. The analysis is backed with numerous case studies of defense decisions carried out from 1979-99. There is no comparative book which provides details of the decision-making structure at the level of the government and the three services of the armed forces, an assessment of cost of military buildup, and detailed analysis of how different stakeholders negotiated with the decision-making structure and amongst themselves to buy various weapon systems.